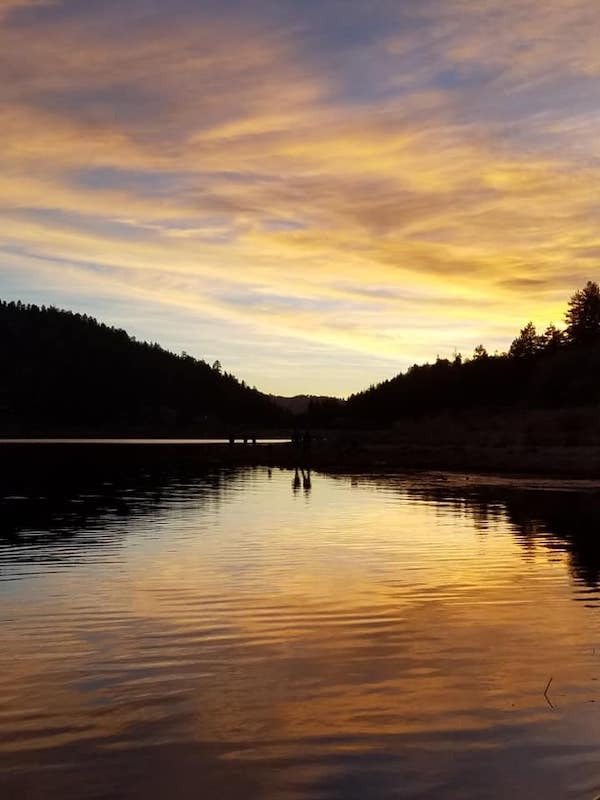 Early Spring on Big Bear Lake offers one of the best opportunities of the year for trout fishing and those who take advantage of this season can enjoy some exceptional fishing, comfortable temperatures and beautiful scenery. 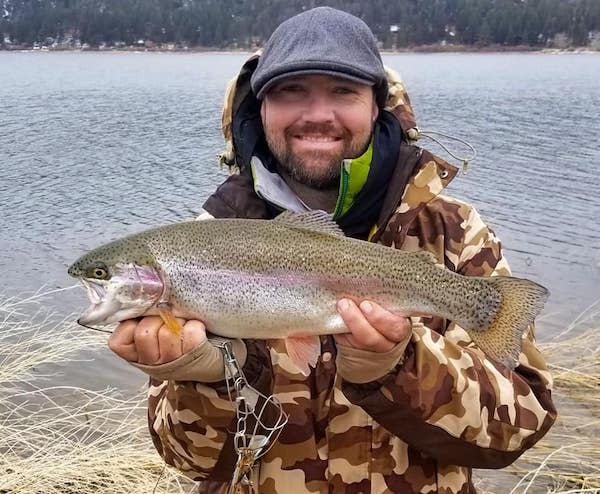 Big Bear Lake’s Rainbow Trout spend most of the Winter months suspended in deeper waters away from the shoreline in an effort to seek stable, warmer water temps and to continue feeding during the lakes’s “Ice Over” . Immediately following the thaw of the lake’s Ice Sheet the fish are lethargic and slow to bite. But that quickly changes as Schools of Rainbow Trout start to move toward the shallows to feed and prepare for their spawn. As water temps begin to rise Big Bear’s Trout population begin their migration from deep water holding areas into the shallows. This pre-spawn movement tends to result in large numbers of fish holding in specific areas that meet their feeding and environmental needs. Anglers need to be aware that shallow water fish activity can change on a daily basis. Weather plays a significant role in the fisheries activity and productivity. 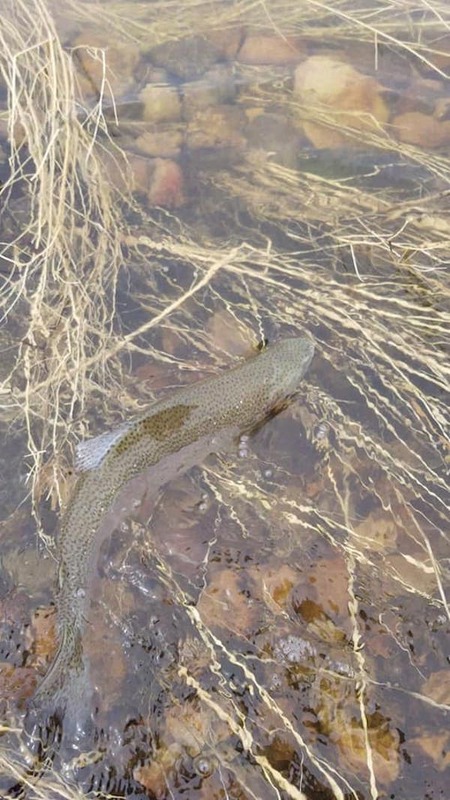 Cloudy days tend to keep the Trout closer to the shoreline, Windy days stirs up silt and they will pull away slightly, Sunny warm days will also cause the ‘Bows to pull out, temporarily, to slightly deeper, cooler waters. Usually just suspending beyond the shoreline shelf and periodically darting back to the shoreline when a feeding opportunity arises. Throughout this pre-spawn period, Trout are concentrating on feeding in preparation to bolster their larders for the spawn. Their peak feeding activity occurs during the early morning hours (before the winds kick up and temps are still down) and then again in the late afternoon and evening hours (after the winds settle down and temps begin to drop). Traditionally, the most productive Spring baits tend to be Power Baits in bright colors and garlic scents fished on a Carolina Rig with a 2-3 foot leader. For shoreline anglers looking to avoid the “Bait and Wait” game should use small sized Rapala’s in Perch, Shad and Trout patterns. Small YoZuri Pin’s Minnow in Pink do well. The “Go To” spoons are Copper, Gold with a splash of red or orange highlights as found in Needlefish, Kast Masters, and Thomas Bouyants. Brightly colored jigs in weights from 1/8th, 1/16th; 1/32nd, and 1/64th of an ounce produce some very nice brood trout near the rocks and boulders found at the west end of the lake near the dam. Shoreline anglers who wish to use live bait like Nightcrawlers should try and fish near inlets where rain and snow water run-off occurs. 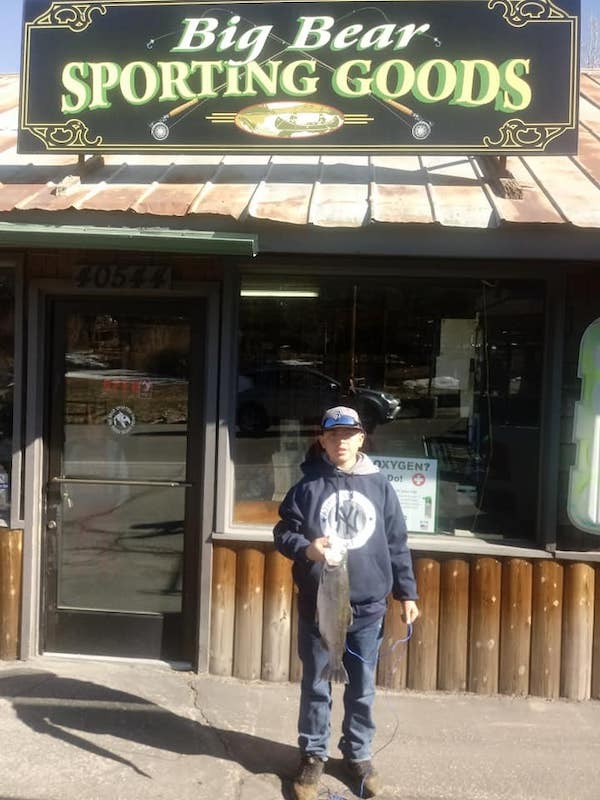 But do not fish tributaries that flow into Big Bear Lake from March 1st thru the 1st Saturday before Memorial Day! These are areas that have been deemed Off Limits by CDFW to protect the Rainbows potential Spawning Grounds Thanks to a Wet Winter with significant Snow and Rainfall Big Bear Lake has risen almost 9 feet!!! Most of the Lakes’s Public and Private Launch Ramps are slated to open April 1st!!! INCLUDING the East Ramp near Stanfield Cutoff. Boaters on the Troll should be 1 to 3 colors in depth ( 4 to 12 feet) will do well with spoons hitting the circuits on the south shore, Trout Alley or running west from the M.W.D.’s West Public Launch Facility west to the Buoy Line near the Dam. 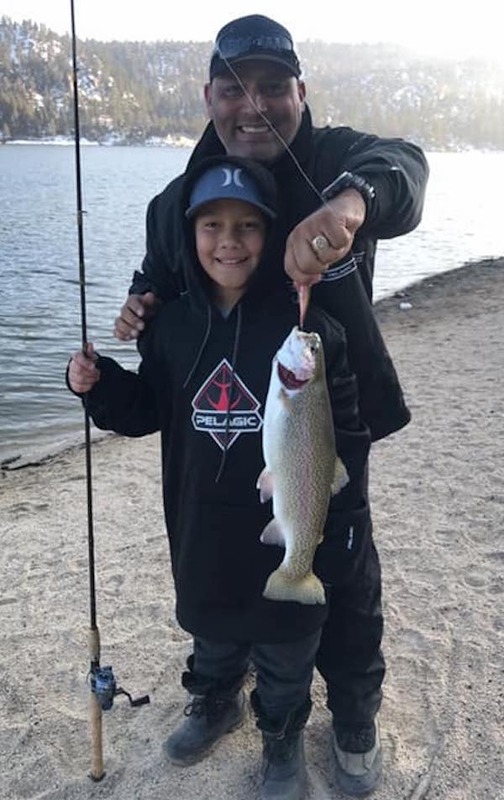 Big Bear Lake anglers can look forward to an Awesome 2019 Season thanks to the higher Lake Level, Supplemental Fish Plants by the Municipal Water District with Monies provided by the Big Bear Lake Visitors Bureau, and artificial structure that was put into place by the M.W.D. , when the lake’s water level was down, to provide better structure / cover for Bass, Catfish and Pan Fish populations. 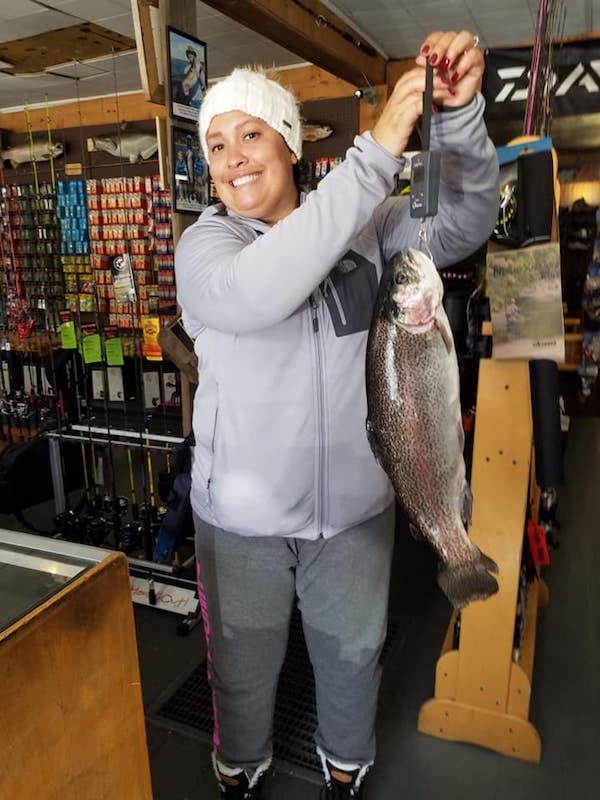 Call BBSG for the latest Water and Fishing conditions and make certain to stop by the shop to gear up before heading out.